This photo of a handbill for a Strawberry Festival was taken on February 7th, 2009 at the Open House for the new St. George Mill Animal Hospital. During renovations of the old Snowball Mill, this poster was found still glued to one of the support pillars that have been preserved. 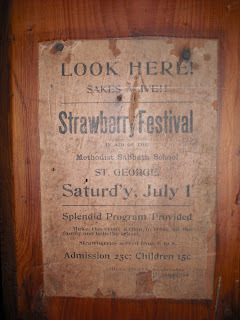 The mystery is – when was this Strawberry Festival? Ashley Cooper was the Superintendant. Are those enough clues for someone to solve the mystery of the Strawberry Festival handbill? 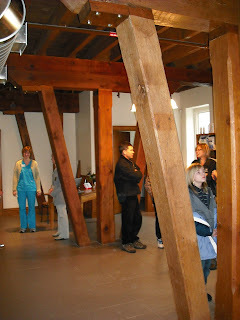 The second photo gives a better idea of how the support pillars have been saved and add architectural interest to the Veterinary Clinic. Honourable Harry Corwin Nixon Marker Unveiled!